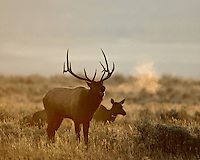 Elk of the Greater Yellowstone Region of Wyoming, Idaho,Montana and Canada. 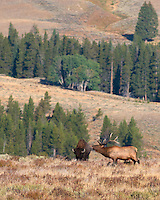 Photos of Bull elk, cow elk, elk calves both portraits and landscapes mostly in Yellowstone and Grand Teton National Parks. Elk calves of spring and trophy bull elk of autumn during the rut. Elk portraits and environmental portraits of elk habitat. Survival photos of wolves hunting elk.